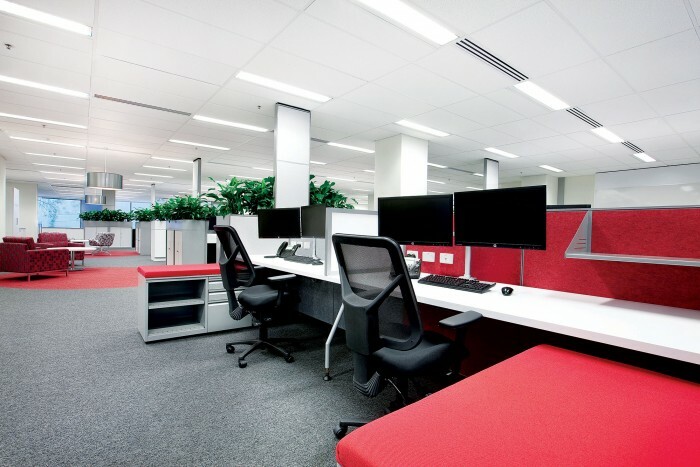 WHK SGG Group Accountants have leased commercial office space at Level 1, 459 Little Collins Melbourne as of March 2012. The look and feel of the space was to keep the logo colours of red, silver and black and use them together to contrast the aesthetics and materials in the space. The result was achieved and a bold, striking and edgy style was created for the staff which was predominately young and energetic. ODC Design was appointed to design and construct WHK new office premises but to also be involved in base building works such as the major core area, male and female toilet upgrade, we worked with building managers Savills. The new office fit out for WHK incorporated 2 boardrooms, large staff breakout area, un-manned reception space, 75 workstations, communication room and general storage.